Visual Studio Code>Other>DashNew to Visual Studio Code? Get it now. Also support Zeal for Windows and Linux. Type cmd + shift + p to launch command palette and choose Extensions: Install Extension. Search this package and install. Pressing ctrl + h. It will search for current specific documentation depends on language. Pressing ctrl + alt + h. It will search for all documentation. Pressing ctrl + shift + h. It will open dash with current file's docset. Pressing alt + h. It will open dash with custom string and current file's docset. This plugin supports language to docset mapping. For other languages that are not supported by default in VS Code, you probably need to install language plugins first in order to allow VS Code to detect the language. This plugin also supports file name matching to docset, this is useful to target docset for any specific file name such as docker.yml or vagrantfile. What is Dash Docset Keys? 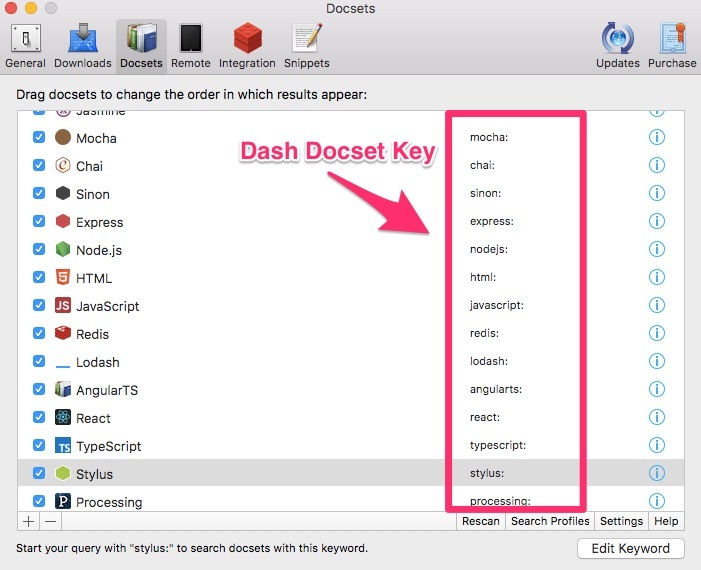 You can find dash docset key in Dash application. You can change docset in settings.json or pressing cmd + ,. Every configuration start with dash.docset. See Docset Setting column in Supported Docset table above.